...the largest organization of planetarium professionals in the world. If you would like to change your membership category based on the latest membership structure, please contact IPS Treasurer, Ann Bragg. IPS honors its own during its biennial conferences. Nominations for the service and technology awards and to be named an IPS Fellow are due by 1 June 2019 in order to be considered during the off-year council meeting later in June. Go to the Awardees and Fellows page for more information. The next IPS conference takes place 18–25 June 2020 in Edmonton, Alberta, Canada. 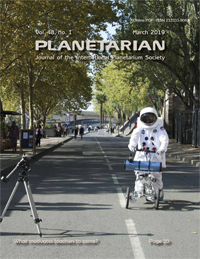 The March 2019 issue of Planetarian, the IPS journal, is available to members. Why do teachers take planetarium field trips? Once you sign in, use the link under the "Members Only" tab of this website. The planetarium was invented in 1923. Get ready to celebrate—help make this birthday a truly stellar event. Read more.